An inn since 1773, the Red Lion has hosted presidents, senators, and other celebrities, these days lodging is situated between a large main building and nine annexes. If you want to experience a historic environment filled with antiques, request a room in the main building. Many guest rooms are small and can be noisy due to thin walls, but the ambiance is authentic. For more space and modern furnishings, request a room in one of the annexes. There are three dining options; all are overpriced. Expect brass bedframes, antique lighting, and wallpaper that evokes the inn's early days as a stagecoach stop. The more expensive the room, the nicer the furnishings and bathroom. The smaller rooms on the 4th floorshows signs of wear and tear. YOU SHOULD KNOW Some rooms are more updated than others. While the antiques are authentic, some upholstery and linens are threadbare. Suites and the most expensive rooms offer magazine-worthy claw foot tubs and updated plumbing. More moderately-priced rooms have average showers and tubs, while the most inexpensive options offer shared bathrooms that show their age. A table that once belonged to Abraham Lincoln. Check. Grand veranda-style porch with wooden rocking chairs. Check. A large sitting room with Victorian-style couches and the inn's cat. Check. There's also a large gift shop with New England trinkets and faux-antiques to make your friends and family back home jealous that you are partying like it's 1899. The heated pool is open year-round. Go for a polar plunge in winter and expect large crowds, especially children, in busy summer months. Fitness room with basic equipment and changing area. There are two restaurants on-site serving New England fare. The main dining room offers formal meals and the more casual Widow Bingham's Tavern is rustic and family-friendly. YOU SHOULD KNOW Hungry at night? a small overnight menu available from 10 p.m. to 7 a.m. can be ordered for delivery to your room. The Lion's Den Pub serves bar food, pints of hearty beer, and offers a respectable wine list. Drop in for live music 7-nights a week for blues, rock, and singer-songwriter performers. 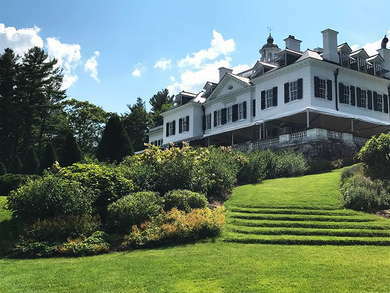 A car is needed to navigate the towns across the greater Berkshires, but there are plenty of cafes and restaurants within walking distance of the inn. For a casual breakfast or lunch, the Main Street Cafe (2-minute walk) offers up sandwiches and lighter fare, including vegetarian options. For American-style Bistro dishes, Once Upon a Table (2-minute walk) can't be beat for lunch or dinner. Be warned it's small and crowded on summer weekends. The Brick House Pub (10-minute drive) is a local hangout with beer on tap and bar food on the menu. If you prefer to sip your craft beer in a more modern atmosphere than the in-house pub, 51 Park Restaurant and Tavern has several dozen beers on the menu as well as upscale pub grub and pizza. For a trip back in time, there's no better option, especially if traveling with a family. Multiple on-site restaurants and pubs, a large gift shop, and expansive lobby give it the feeling of a destination event, like a New England version of Disney World. The caveat being the inn is more than 250 years old and retains much of its authenticity and original features including an operator attended elevator, a table that belonged to President Lincoln, and an extensive antique teapot collection. If you prefer ultra modern furnishings and bathrooms, and a quiet environment (the floors creak in the best way possible), this is not the inn for you.